flafuncop has no other items for sale. Power Source: Electric Material: All Steel Construction - Made in U.S.A.
Save up to $9.99 on shipping when you buy additional eligible items from flafuncop, when you use the cart to make your purchase. Will usually ship within same business day if paid before 13:00 PDT (excludes weekends and holidays). Expected ship time may vary and is based on seller's order cut-off time. If you are going to do business online, you need to do business with someone like this company. I wanted to speed up shipping, and reached out to the company. Not only did he answer my question, he had already emailed me, called and left a message, and more. Now that's how to do business. I'm pretty hard to impress, because I've been ripped off before. But this company deserves my review of at least 5 stars. He's got his priorities straight, great product and very nice price. Plus, if you contact him, he is on it. So, I say thank you to this company, and would refer them anyday. These are very nice units, as long as you get the correct one for your application. A lot of times we as consumers tend to get the bare minimum, in the case of electric tankless water heaters I would recommend always getting the next size bigger that you think you need.. I like the water heater so far. My only gripe is that I know there is a reset button inside the cover but they have not provided a hole in the front cover to access it, you have to take off the cover which voids the warranty! 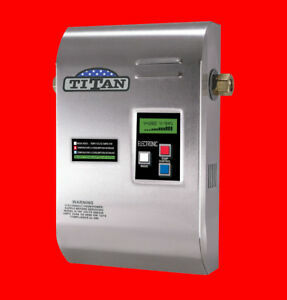 Great water heater for the price. I have a 3 bedroom 3 bathroom home and its perfect for keeping water hot when 2 or more appliances are working.